The facelifted Nissan Grand Livina has been introduced to journalists in Indonesia, ahead of an official launch next week. Readers of this website would have already seen the revised Livina range, via spyshots and a live gallery from Auto Shanghai 2013. The Indonesian market, the first in the region to get the refreshed Grand Livina, will get an improved MPV. Besides the exterior updates, which we have detailed in full here, there’s an updated HR15DE 1.5 litre engine with dual injectors and twin CVTC for both intake and exhaust. This mill alone is said to be 4% more fuel efficient than the outgoing 1.5L engine in Indonesia. More importantly, the seven-seater will come with Nissan’s X-Tronic CVT gearbox in Indonesia, replacing the torque converter four-speed automatic. This should further imporve economy, besides providing a smooth, silent ride. A five-speed manual will be the other transmission on offer. The facelifted Livina range is sure to arrive in the near future, and Tan Chong has already been spotted testing the MPV ahead of local assembly. But what remains unknown is the chosen powertrain for Malaysia – carryover 1.6L or updated 1.5L, conventional automatic or CVT. 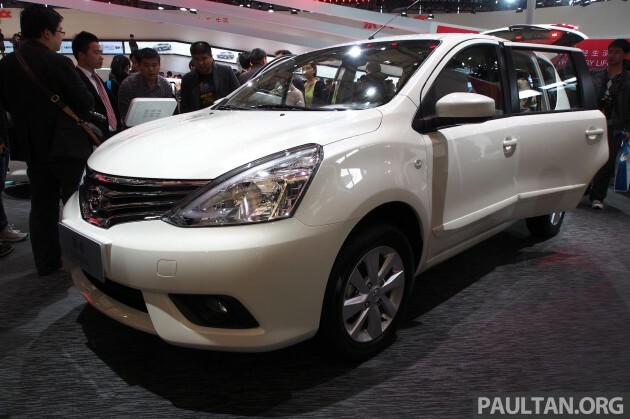 The pics below are of the facelifted Livina from Auto Shanghai 2013. Too boxy! front is kinda nice but rear is terrible! I rather have it that Nissan just keeps the existing design and upgrade the internals instead. the current one looks ok. but yeah, should update the spec. audio steering wheel control. leather seat. automatic aircond. The rear design especially the rear lamp is so unacceptable. can TC put that damn adjustable seat belts. i wonder why that tiny feature not being put on 98K MPV. better buy exora. im not a proton SA okay! Exora CFE can eat this for breakfast, brunch, lunch, dinner, supper, anytime. Haha! Asshi, may i ask u, what about the cheap badge? Your thumb downs number answers it, haha! Thumb downs coz they r just pretending like ahh doesn’t matter… I am sorry and i know what u feel. Adoiii! When lah they are going to announce the Serena c26. Boring boring nissan. ya.. exora cfe is more value for my money.